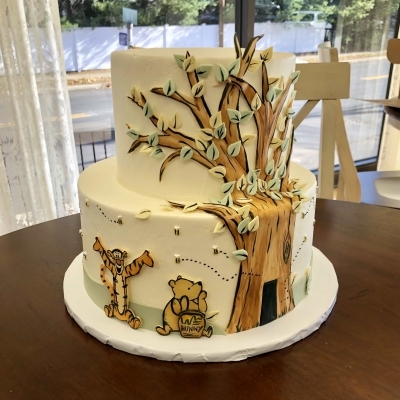 This adorable little 2 tier cake is iced in buttercream and has hand-cut and drawn fondant characters. 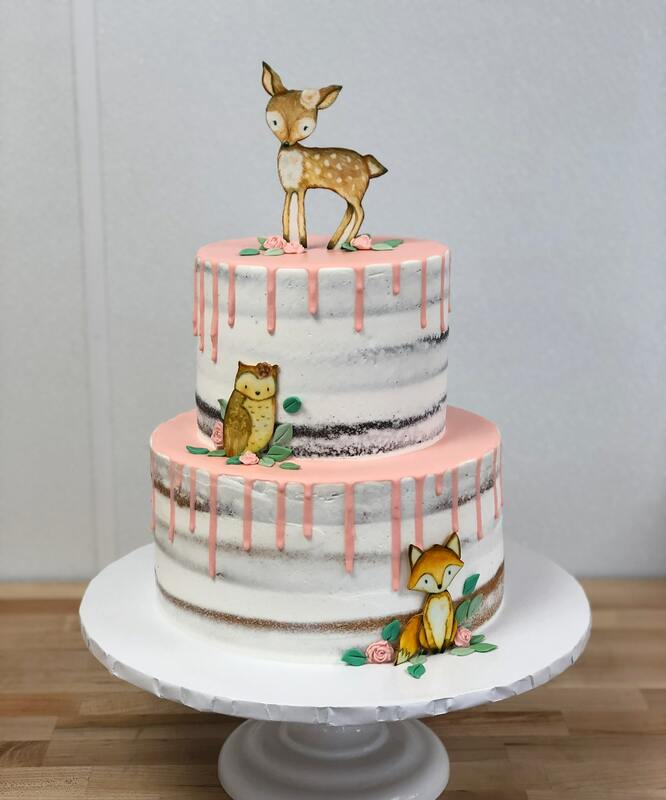 This 2 tier naked cake has a pretty pink drip, with edible images of sweet little animals. 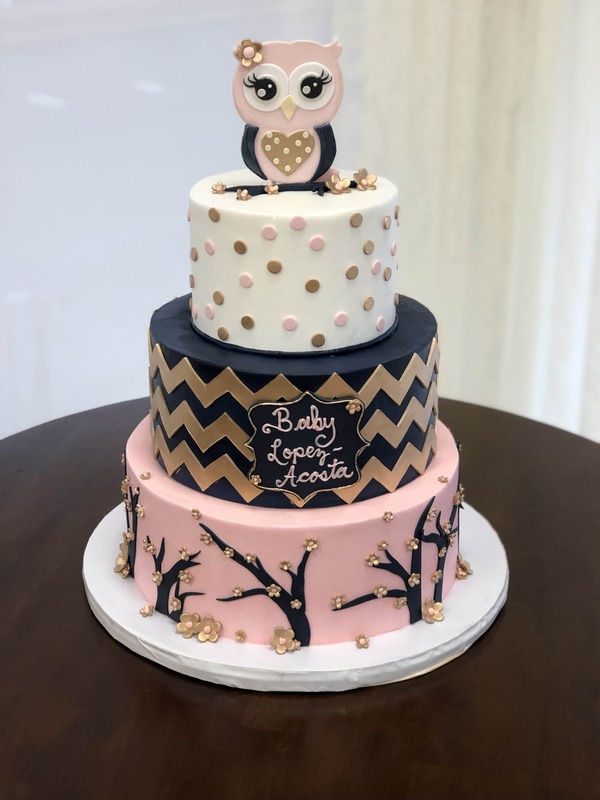 This adorable 3 baby shower cake has pale rosy pink, dark navy blue and white buttercream iced tiers, with gold accents throughout. 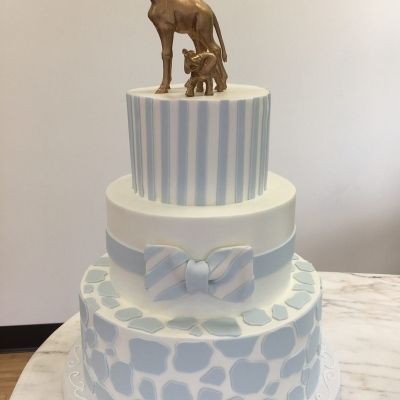 The cake topper is made from fondant! 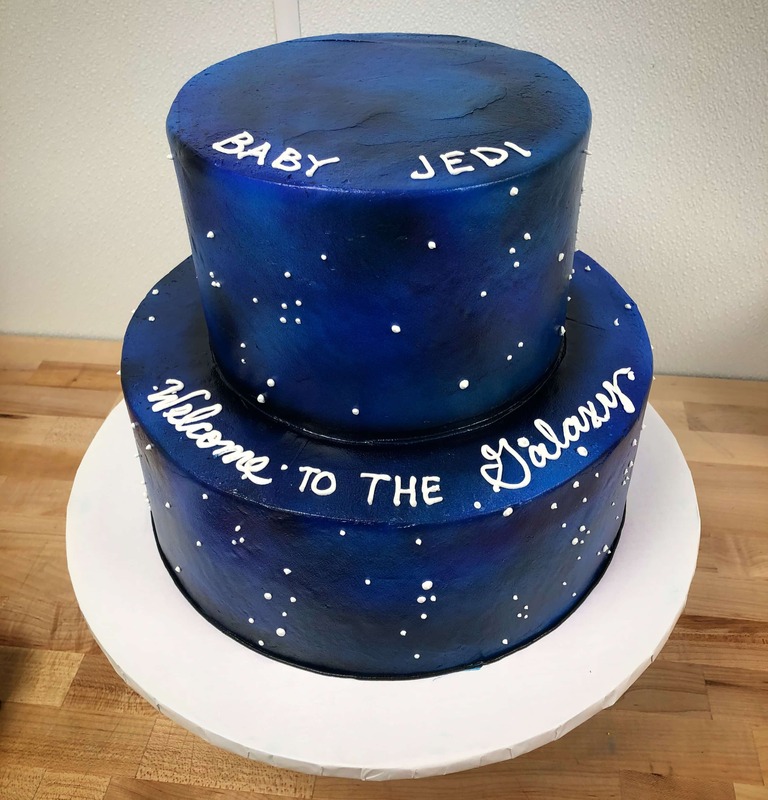 Welcome to the galaxy, it's a Jedi! 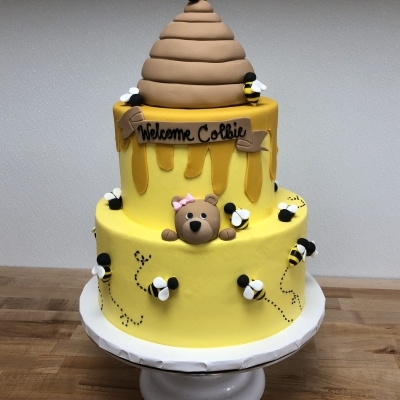 This 2 tier buttercream iced baby shower cake has fondant bumblebees, a fondant covered beehive topper and a sweet little bear. 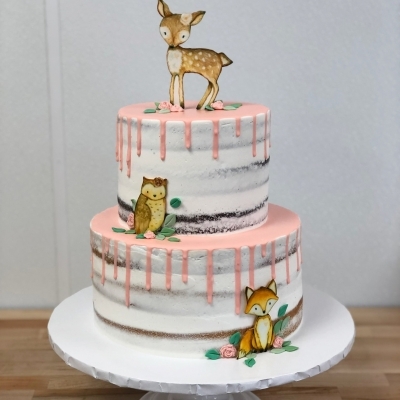 Iced in a delicious Swiss Meringue Buttercream, this clean and simple baby shower cake has fondant giraffe print on the bottom tier, a cute little bow tie on the middle tier and stripes on top. 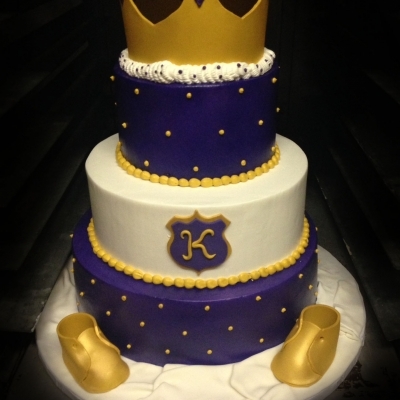 This cake is topped with a gold giraffe and elephant, provided by the customer. 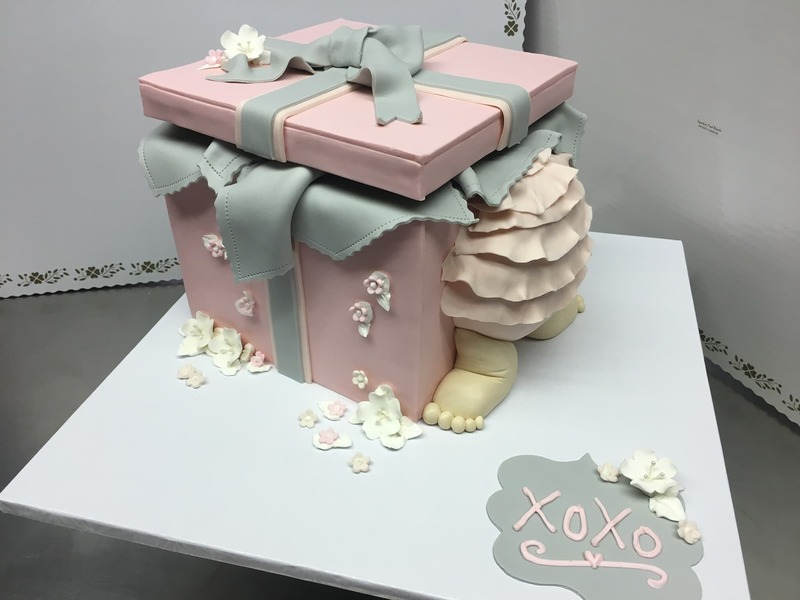 Three tiers, iced in buttercream with fondant ruffles and a pretty fondant bow. 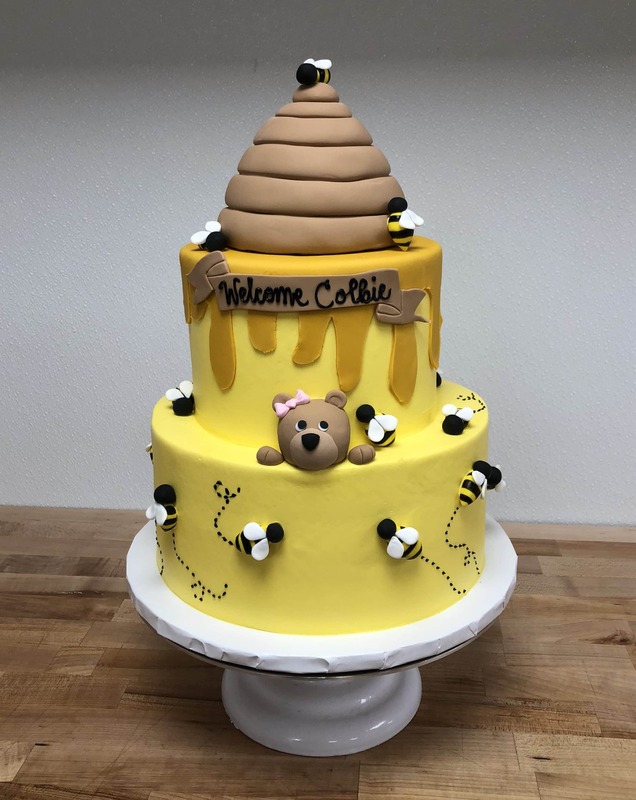 This 2 tier ivory textured buttercream cake is simply decorated with a fondant wood sign, a few fondant pumpkins and a custom made topper. 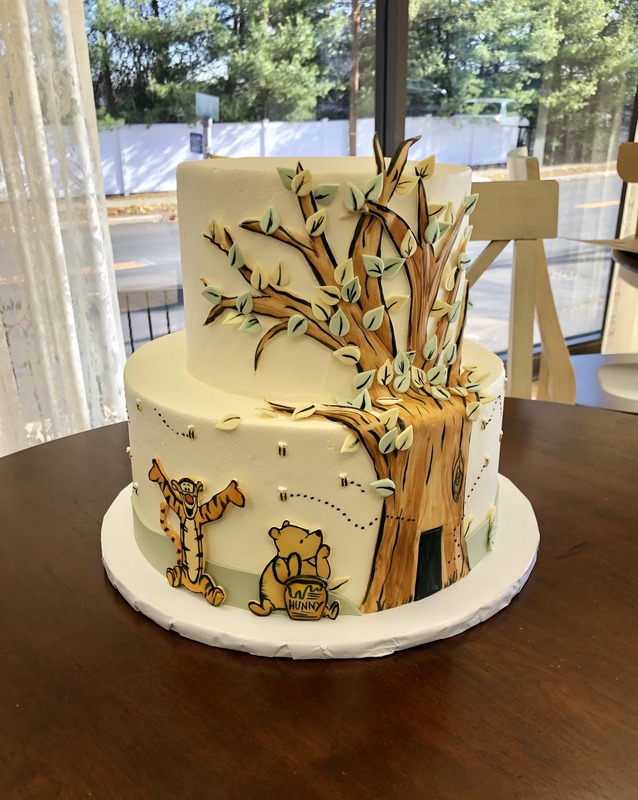 Perfect for a fall baby shower! 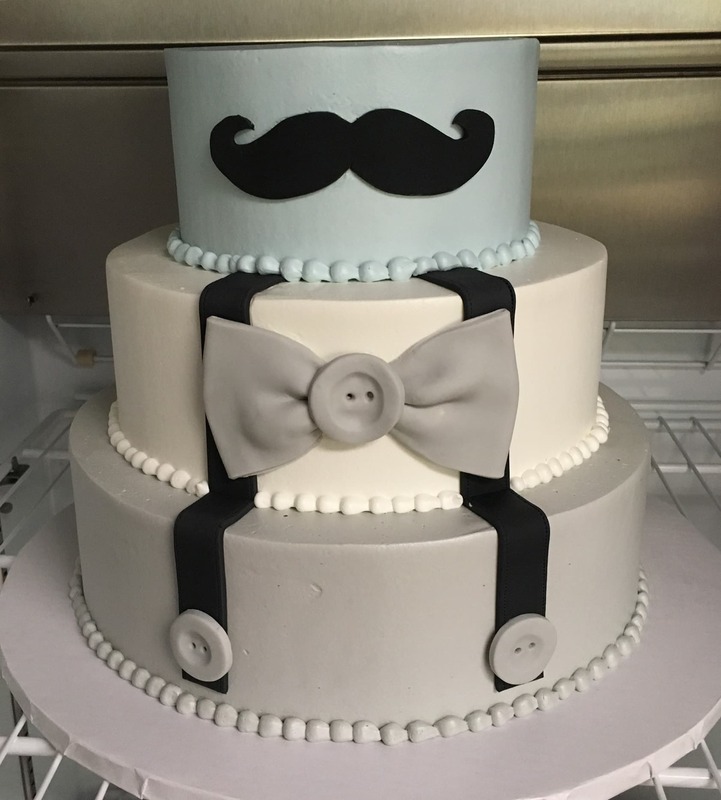 This buttercream iced 3 tier cake has fondant suspenders, a bowtie and a mustache for a dapper little sir baby shower! 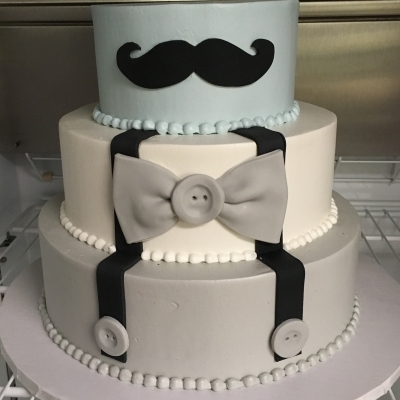 This cute 2 tier cake is iced in buttercream, has a fondant bandanna knot on the bottom tier along with fondant ropes around each tier. 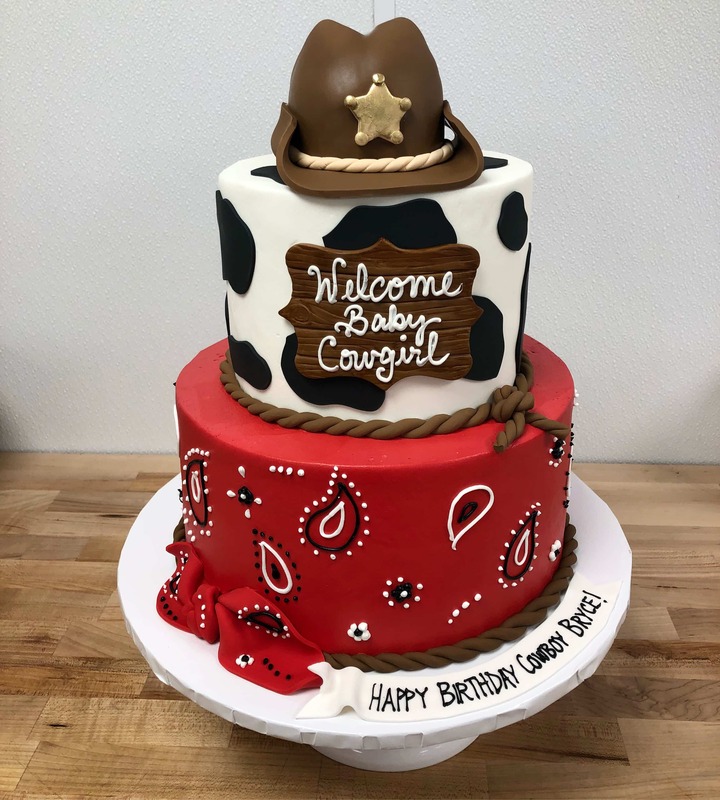 The cow print and wooden sign all created using fondant as well. 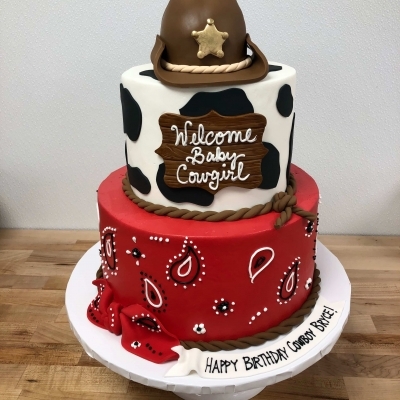 The cake is topped with a 3D edible hat topper. 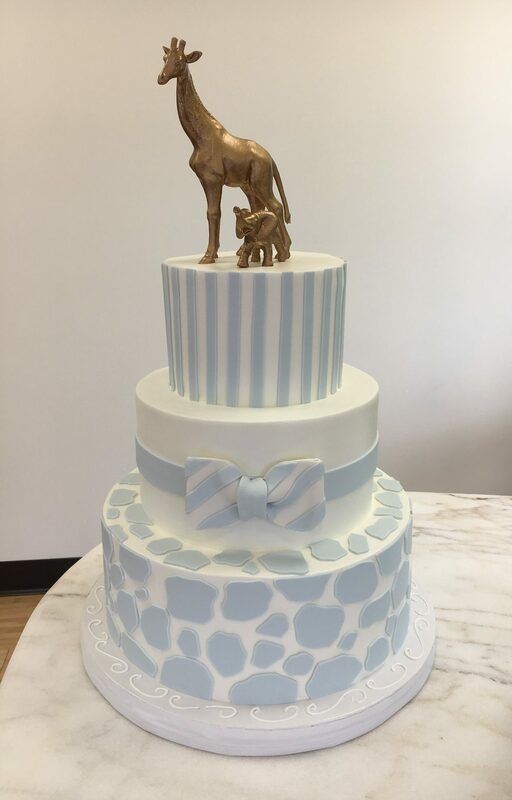 This 3 tier buttercream iced cake has a fondant chevron pattern on the bottom tier and polka dots on the top tier. 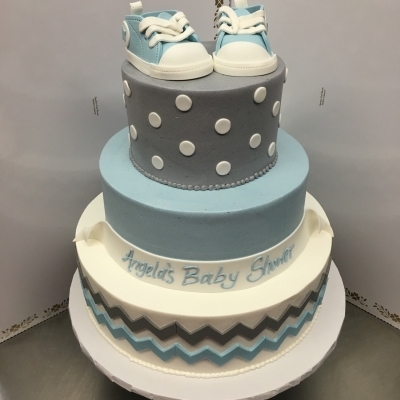 The whole look is completed with two adorable baby Converse sneaker toppers. 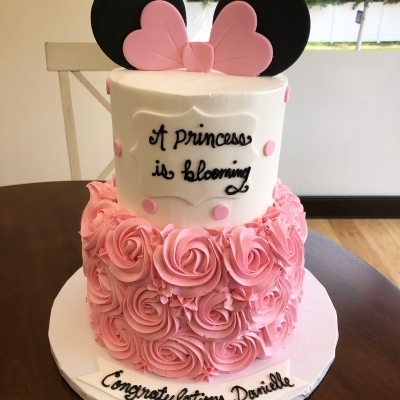 Combine pretty pink rosettes with adorable Minnie Mouse ears for a sweet baby shower cake! 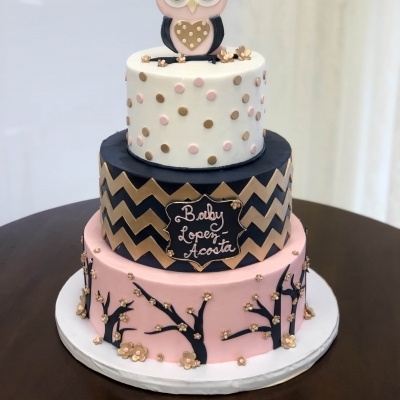 3 Tier buttercream iced baby shower cake with a simple pink pin dot design, along with diamond banding around the base of each tier. 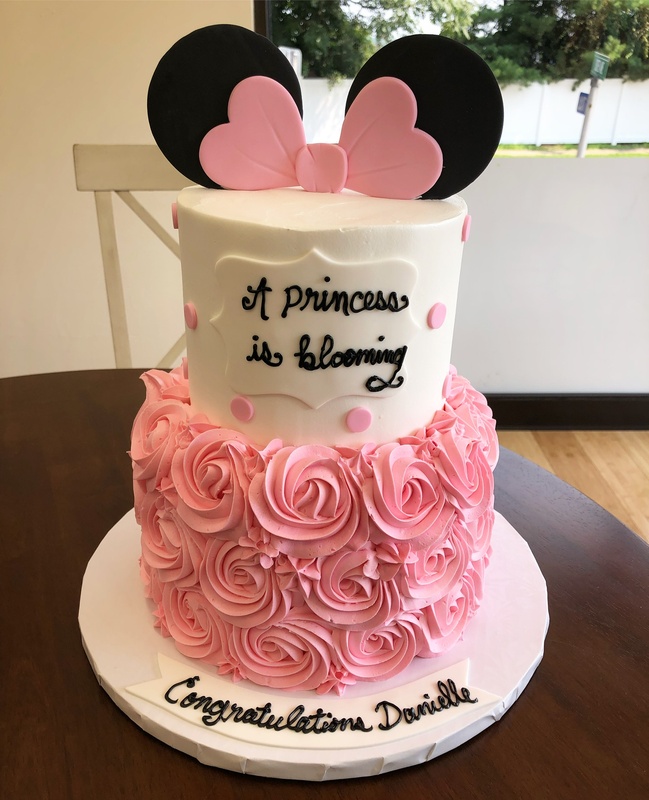 This cake is decorated with fondant baby blocks on the base, a large pink fondant bow and a custom pink fondant tiara with hearts. 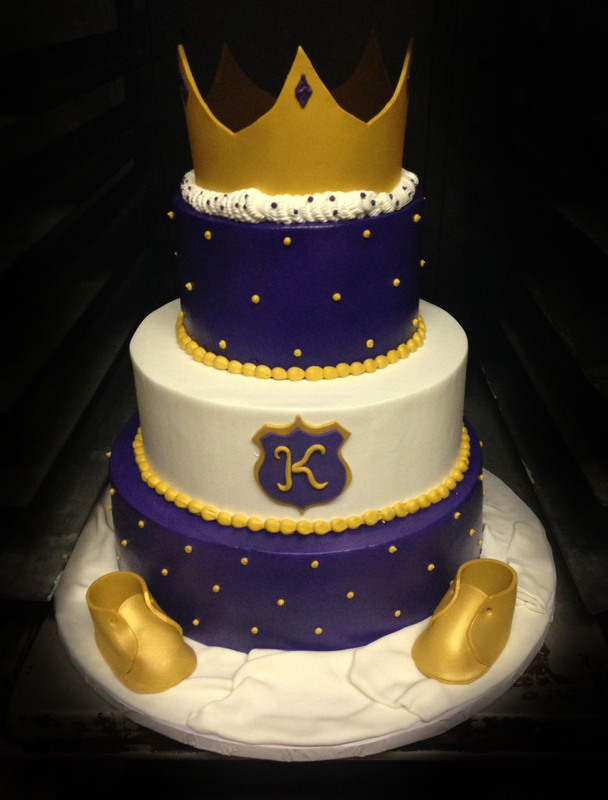 This royal purple tier cake is fit for a little prince, with a gold fondant crown and baby booties! 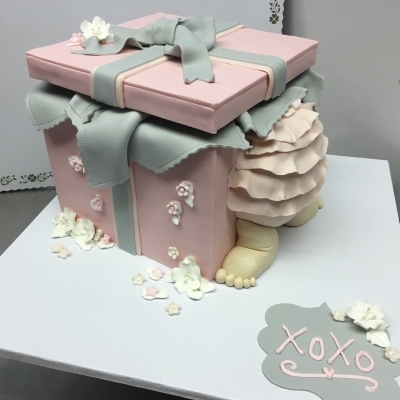 This 3 tier buttercream iced shower cake is topped with a fondant umbrella and has shades of pink drips all over, perfect for a baby shower! This cute little buttercream cake has pink rosettes on the bottom tier and a fondant chevron print on top tier. 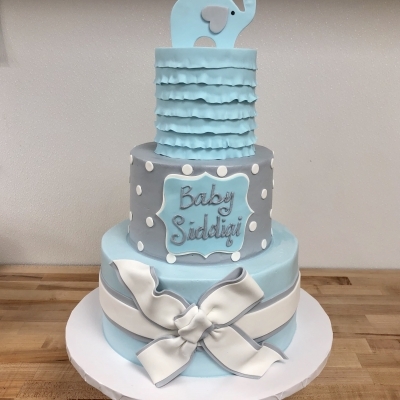 This cake is topped with a hand-made fondant elephant. 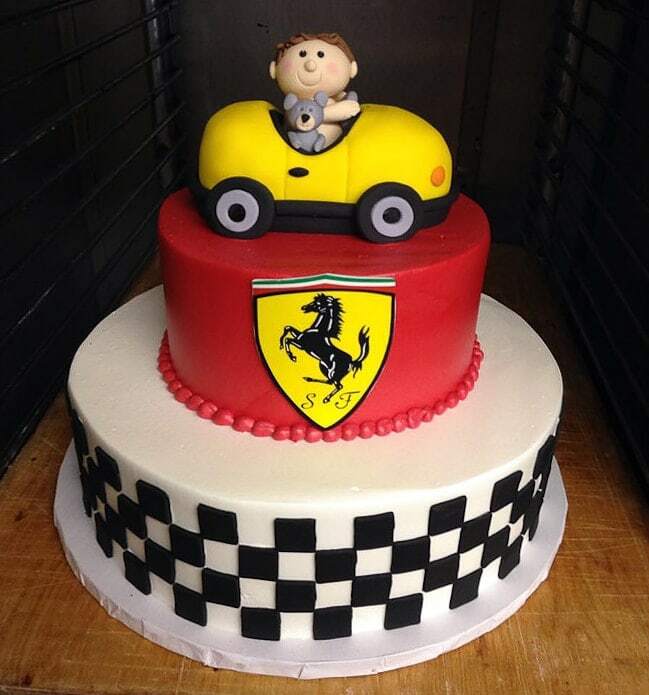 This 2 tier baby shower cake features a checkerboard bottom tier and a bright Ferrari red top tier, complete with the Ferrari logo. The cake is topped with a little yellow car cake and sitting inside, a fondant baby and his teddy bear! 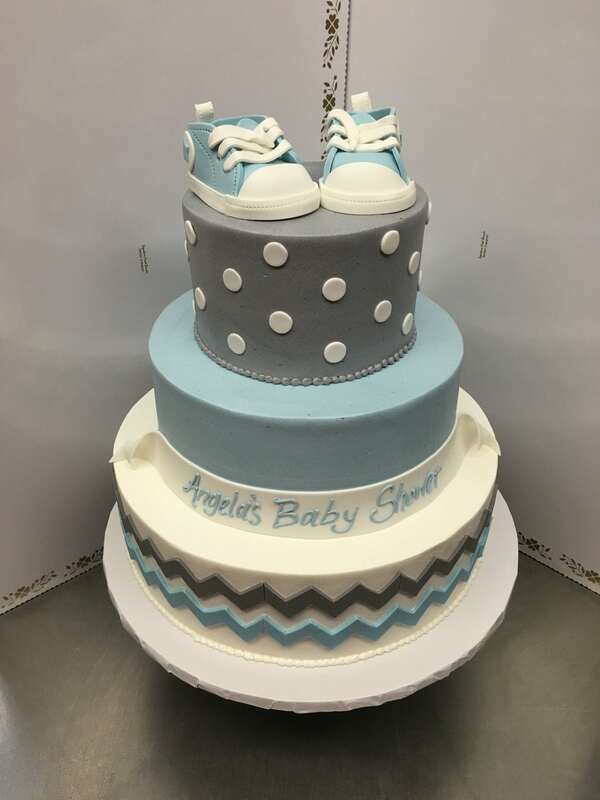 This 3 tier buttercream iced baby shower cake cake has fun, multicolor fondant polka dots on the bottom tier and stripes on the top tier. 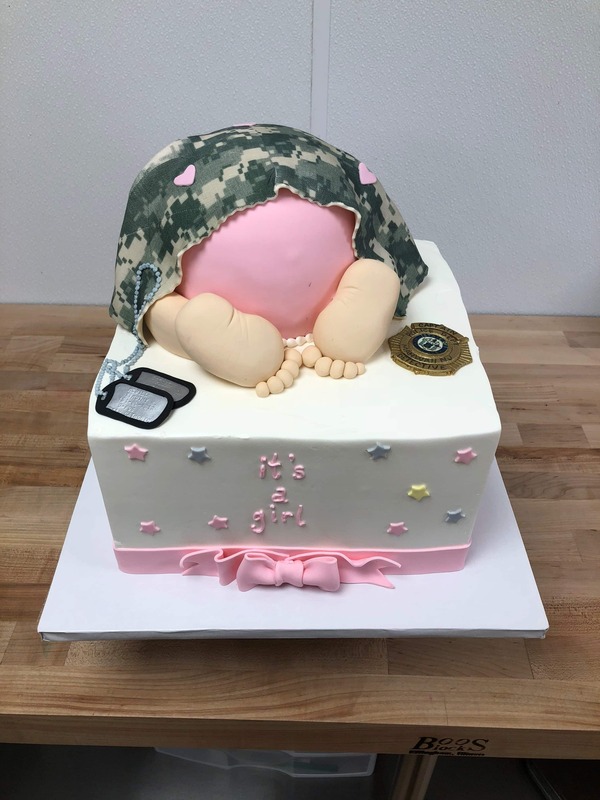 The cake is topped with a flat fondant rubber ducky. 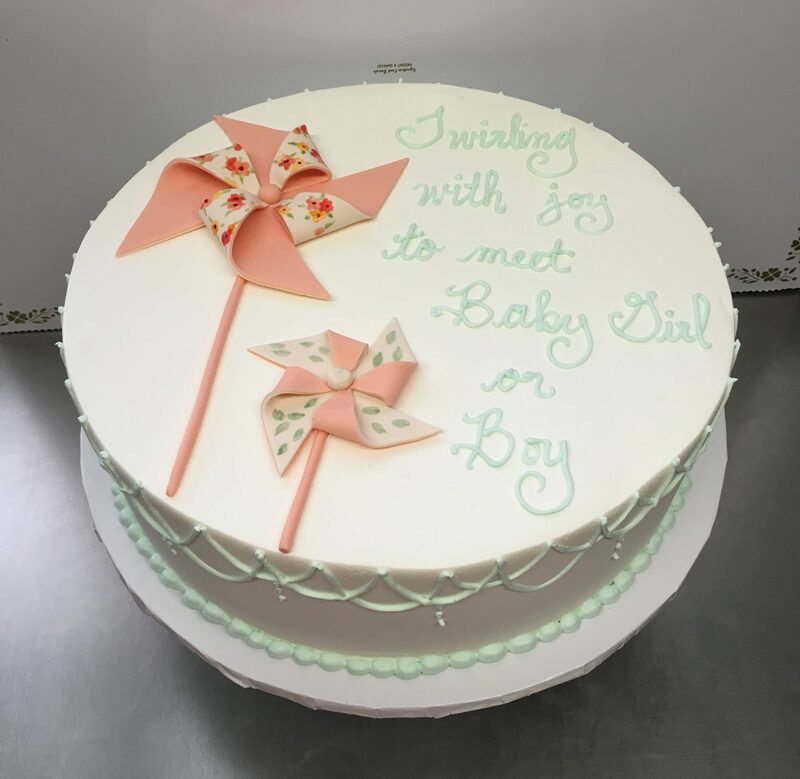 This buttercream iced baby shower cake has a neutral theme with pretty shades of green and vintage pink. 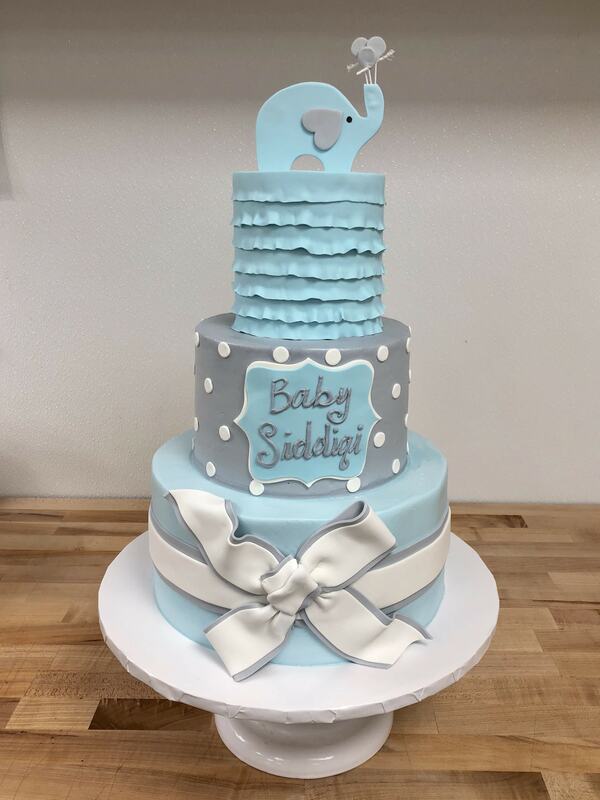 This sweet baby shower cake is iced in buttercream with lots of little buttercream flowers and butterflies, with a precious fondant sleeping baby topper. 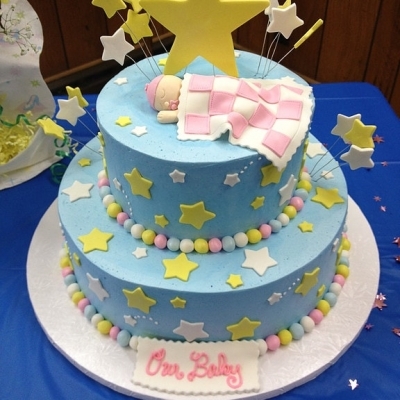 Two tier cake, iced in buttercream with pretty yellow and white fondant stars. 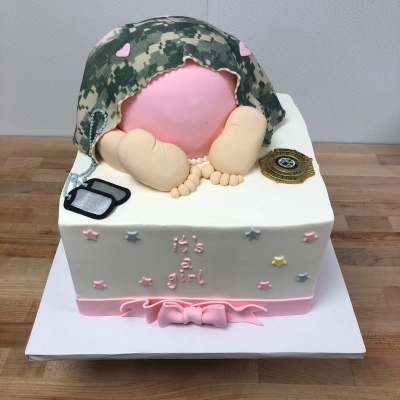 The cake is topped with a fondant sleeping baby topper under a blanket. 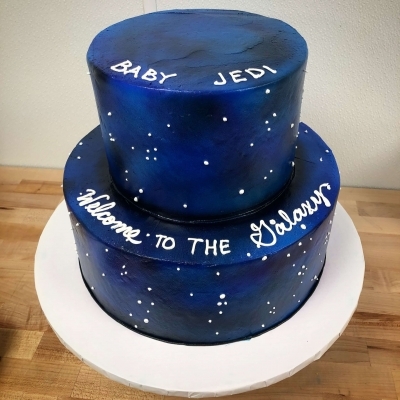 This 2 tier buttercream iced cake has a square bottom and a star shaped top tier. 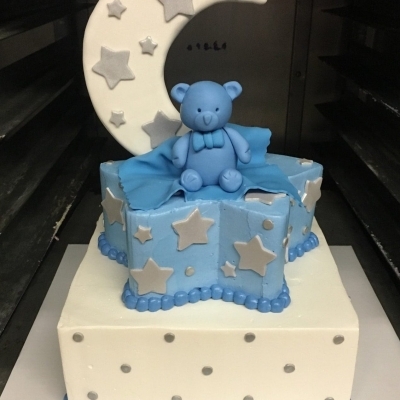 A blue fondant teddy bear and large moon topper complete the cake. 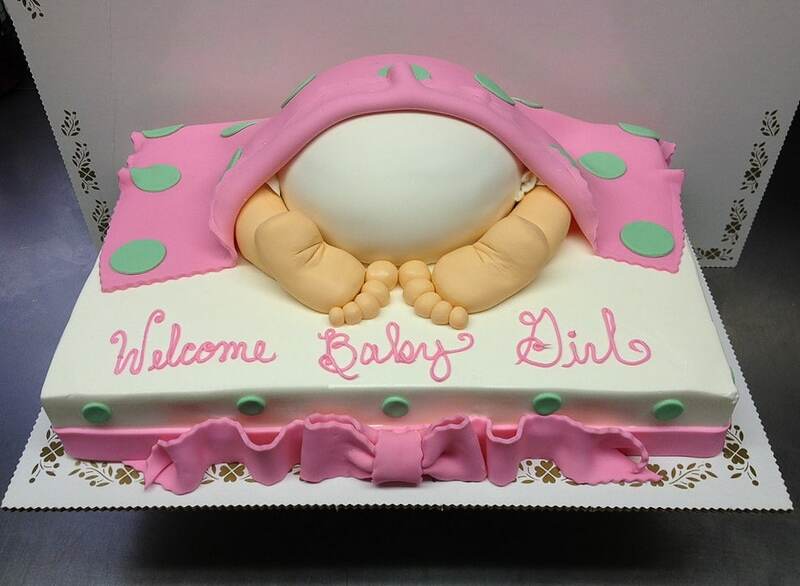 This buttercream iced sheet cake is topped with a fondant covered baby bottom, underneath a fondant blanket. 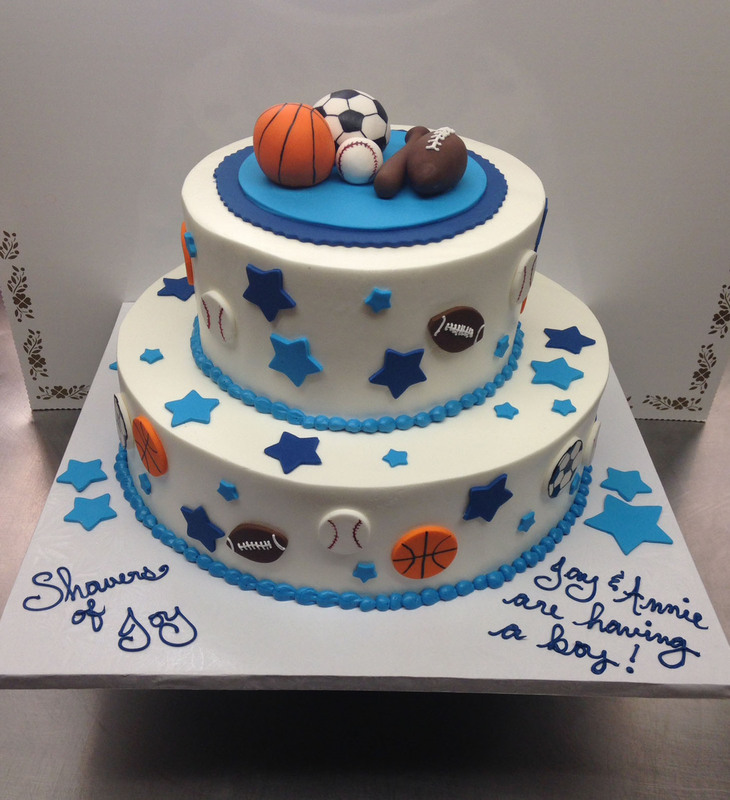 This cake can be customized using any colors to match your theme! 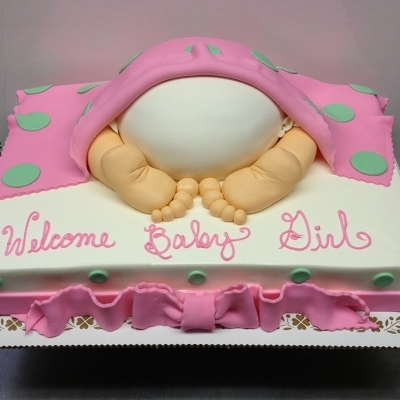 This blue buttercream iced round cake has buttercream bubbles all over and is topped with a pink 3D rubber ducky cake. 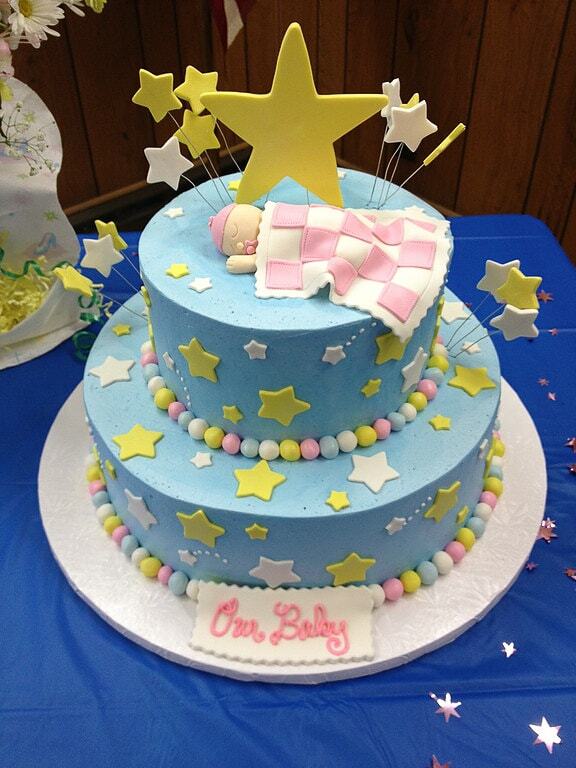 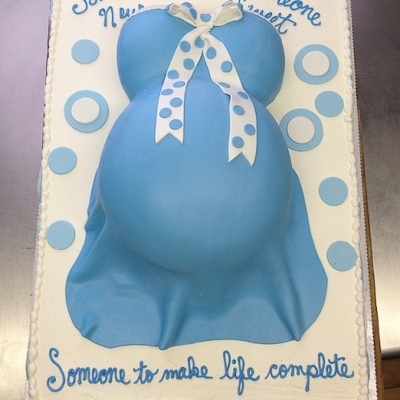 This cake is perfect for a baby shower or a gender reveal party! 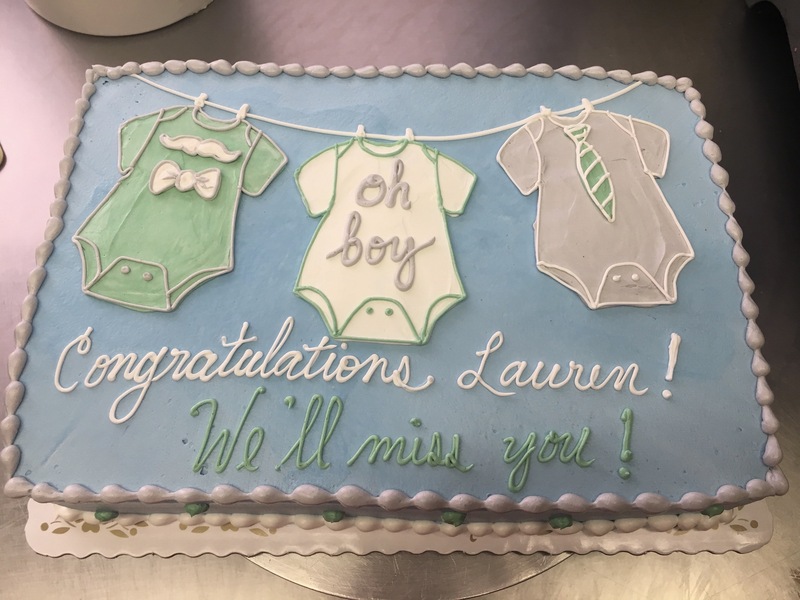 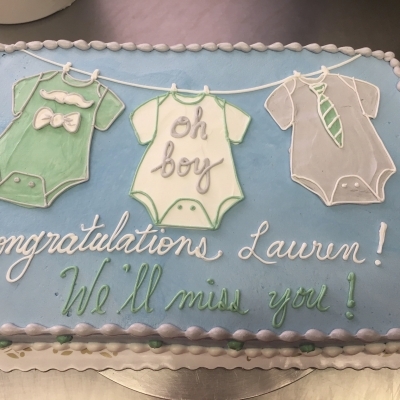 Showers of joy for a new baby boy! 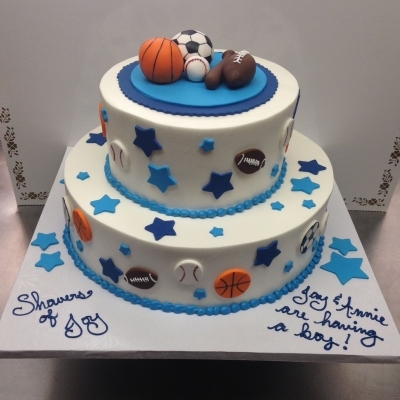 This buttercream iced sheet cake has fondant baseballs, footballs, baseballs and soccer balls all over! 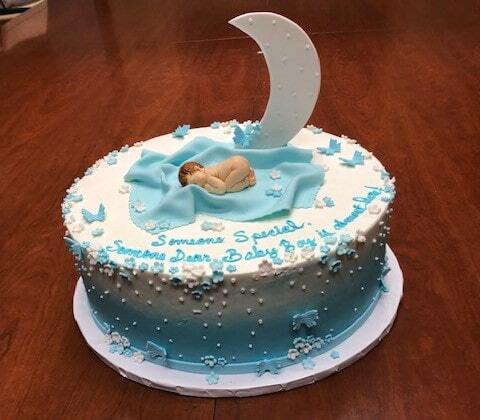 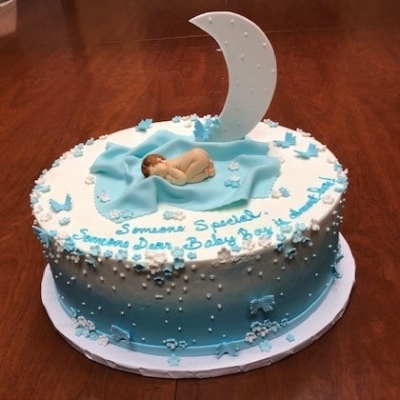 This full sheet cake is iced in buttercream and has a pregnant baby belly cake on top. 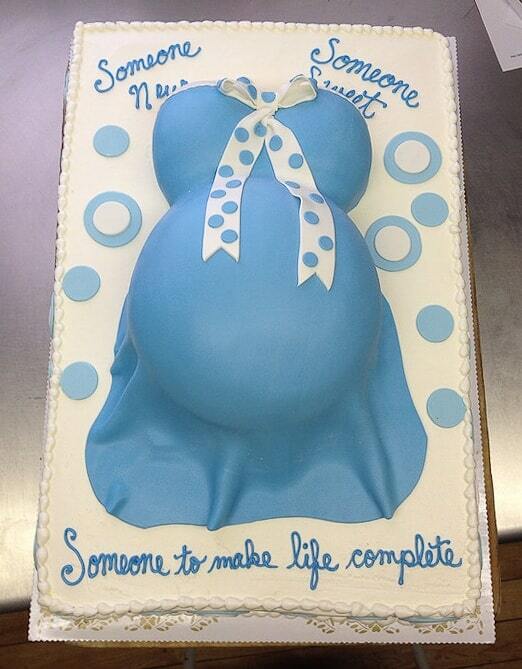 The baby belly cake is covered in fondant to create a dress and can be customized to any color scheme! 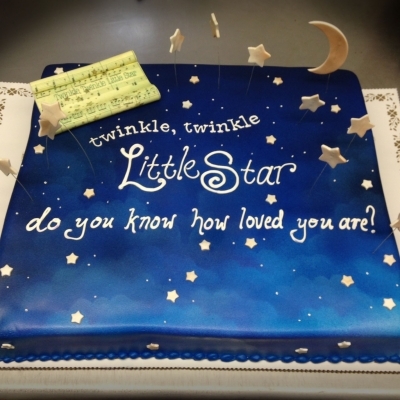 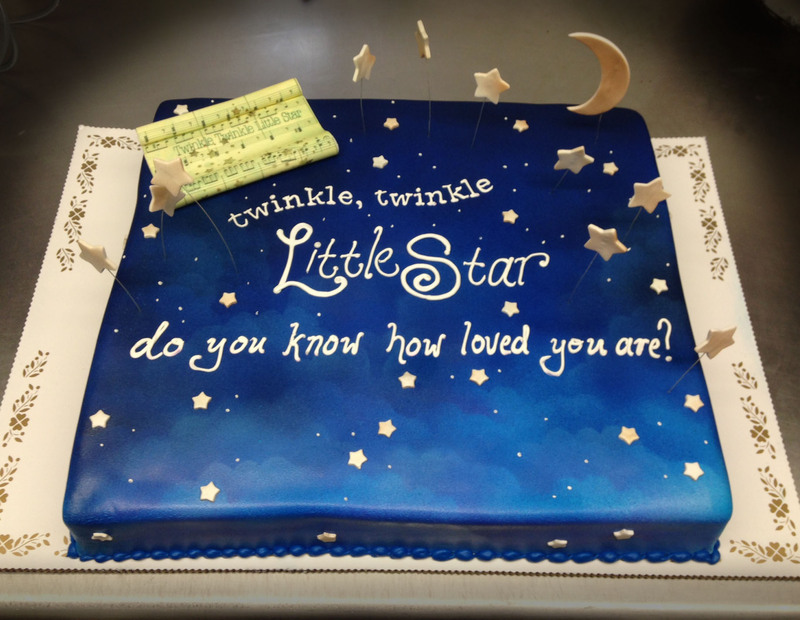 This fondant covered sheet cake has an airbrushed cloud pattern, with little gold stars and a "Twinkle, Twinkle Little Star" lyric sheet. 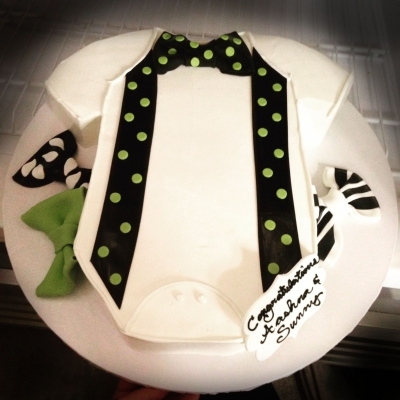 This dapper onesie shaped cake has fondant suspenders and lots of cute bow ties! 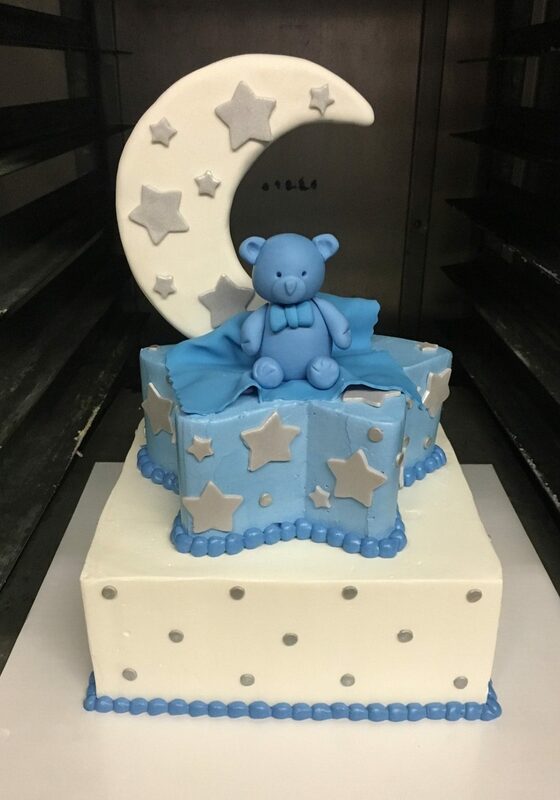 This buttercream sheet cake has the cutest little onesies drawn on top and can be customized with any colors and designs!